The migration to expanded text ads (ETAs) is still something that advertisers deal with, even today. 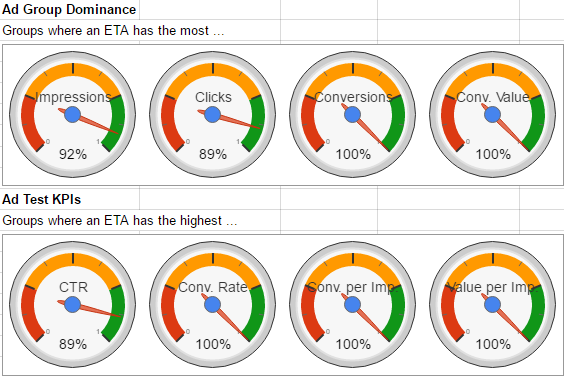 At my agency, Bloofusion, we’ve used an AdWords script in order to keep track of our progress. Today, I’m sharing this tool. As you can see, the first thing it tells you is how many ad groups already have ETAs. You also get an overview about the contributions that ETAs make towards impressions, clicks, conversions, and conversion value. Ideally, those are close to 100%. It’s easy to accomplish this by just deleting your old Standard Text Ads (STAs), but that’s of course not exactly the best way to go about this… but more on this later. This list includes the number of ETAs and STAs for every ad group. It also shows how statistics are split over these to ad types. The color-coding helps to identify potential problems. Here we can see, in how many groups ETAs are already performing best. The upper row shows this regarding absolute statistics (but only for groups that actually have impressions, clicks, conversions or conversion value). The second row works does the same with regards to common ad test KPIs. Just like everything else, the summary can be found in the spreadsheet. Check the logs to find the spreadsheet’s URL. * Written by Martin Roettgerding. * © 2017 Martin Roettgerding, Bloofusion Germany GmbH. // How many days of ad stats should be taken into account? Default is 7 for the last 7 days. // Also possible are strings like: "THIS_MONTH", "LAST_MONTH", etc. (check AWQL documentation for more). // Also possible are concrete timeframes, like "20161201, 20161231". // Use "de" for German. Everything else defaults to English. // Check if this is running on MCC level or account level. // Safe the ads CTR/CR/CpI/VpI if it's the highest in the group. // Translates the results into an object to be used by the writeBack function. // Sort the results sheet name (which comes down to client name). This way the sheets will be in order later. * Creates a spreadsheet and saves the results. // All templates are stored in a master spreadsheet. // Log the spreadsheet's URL so that it can be found by the user. // Write the summary data right away. By default, the script uses data from the last seven days. To change this, use the setting “statsTime”. If you want to limit the script to some specific accounts in an MCC, you can label them and then enter the label’s name as “accountLabelName”. This can be used if you have more than 50 accounts and want to go through them step by step. The resulting spreadsheet is in english. If, by any chance, you want it in German, set “language” to “de”. Alright, have fun – and if you find the tool useful, send some feedback! This entry was posted in AdWords Scripts by Martin Roettgerding. Bookmark the permalink.